What is an MOT and why is it important? The Ministry of Transport test (or MOT test) is an annual safety check to ensure the vehicles on our roads meet the minimum safety standards and levels of exhaust emissions, as set by the DVSA (Driver and Vehicle Standards Agency). Taking your car to be checked by a fully trained MOT tester is the only way you can be certain that it’s fit to be on the road. When will my car need an MOT test? Once your vehicle is 3 years old, it will need an annual MOT test. You are welcome to bring your car in to be tested up to one month before the date of expiry, as shown on the previous MOT certificate. Car technicians recommend that you carry out a few quick and simple visual checks before taking your vehicle for its MOT test. Conducting the below checks will ensure that your car has the best chance of passing, saving you time and money. Check your number plates are clean and legible; design and spacing must also follow legal requirements. Check the windscreen for any signs of damage; chips greater than 40 millimetres across will lead to a fail on your MOT. If damage has occurred in the driver’s line of vision, in the swept area of the windscreen, chips of over 10 millimetres or more will also incur a fail. Press the brake pedal and ask a friend to check that the lights come on, including any supplementary brake lights. If you’re alone, reverse your car to a window or garage door, checking your lights in the reflection. Check that the headlights, sidelights, hazard lights and indicators are all in good working order. As one of the most important safety features of any vehicle, it’s not surprising that your seatbelts will be checked in an MOT (including those in the rear seats). Inspect the length of each belt for damage, and tug sharply on each of the belts to ensure that they react accordingly (as they would in a collision). You should check the tread depth of your tyres regularly, and in preparation for an MOT. Keeping your tyres in good condition is crucial to staying safe on the road; by law, the minimum tread depth of a tyre is 1.6 millimetres across the central 3-quarters of the tread, and around the entire circumference of the tyre. To test your tread depth, put a 20 pence piece in the tread; if the outer band isn’t visible, the tyre still has enough wear in it. Toyota recommends replacing your tyres once your tread depth has reached 3 millimetres. Ensure your wipers are cleaning your windscreen properly, leaving no smears or smudges. Check for any tears or holes in the wiper rubber; damages to your wiper blades can result in an MOT failure. Remember to top up your screen wash too before taking your car to be tested. Make sure your vehicle has at least a quarter of a tank of fuel in it, and that the engine oil is at the correct level; a test station may refuse to carry out an MOT on your car if either the fuel or oil are too low. If you’re unsure what kind of oil your Toyota needs, please contact your local Toyota centre for assistance. Finally, give your horn a quick beep. If it doesn’t work, get it fixed or replaced. If it’s time for your car to have an MOT test, you can book one at your nearest Toyota centre. 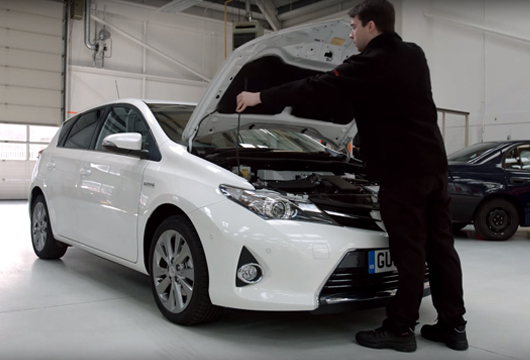 If your car does need any work doing to it in order to pass an MOT test, our highly trained Toyota technicians will carry out any necessary repairs using genuine parts, meaning your car can return to the road in premium condition.